MolluscaBase is a taxonomically oriented database which aims to provide an authoritative, permanently updated account of all molluscan species. Mollusca are the second largest animal phylum on Earth after arthropods. The number of valid Recent species is currently estimated around 45,000 to 50,000 marine, 25,000 terrestrial and 5,000 freshwater (Appeltans et al., 2012; Rosenberg, 2014). The number of fossil species is not known accurately, but is in the same order of magnitude and may range between 60,000 (a conservative guess, Taylor & Lewis, 2007) and more than 100,000 species. 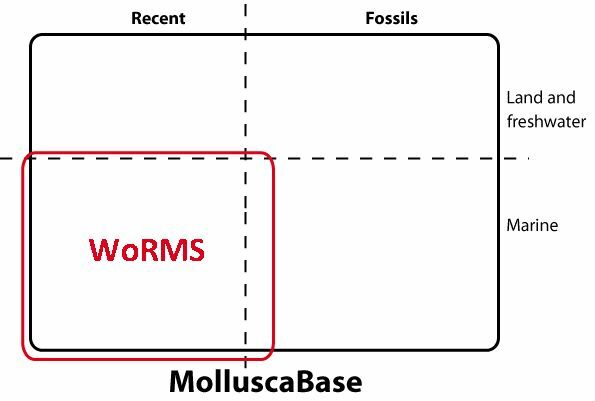 The recent, marine component coincides with the Mollusca entries in the World Register of Marine Species (WoRMS), whereas the continental and fossil components are not displayed in the WoRMS interface. The basic taxonomic unit in MolluscaBase is the binomen, i.e. the combination of a genus name and a specific epithet. Some scientists make an extensive use of subgenera and/or subspecies. Such combinations are flagged in MolluscaBase as "alternate representation", i.e. both name strings (with/without subgenus, with/without subspecies) are taxonomically correct, but only the binomen is flagged as "accepted". Molluscs have made their way to almost every ecosystem, from the most arid deserts to the deepest ocean trenches. In the sea, they are one of the most important groups of invertebrates, accounting for roughly one-quarter of the species. They are also an important food source for many marine animals, and subject to exploitation and cultivation for human consumption. They have been around for a long time and were persistently a prominent part of the world fauna since their appearance, about at the same time as most animal phyla, some 550 million years ago. Their fossil record is however far richer than that of other groups because most of them have a calcareous shell which is easily fossilized. A phylum is defined as a comprehensive group of animals which share a common ancestor and the same basic configuration of their body plan. This applies to molluscs but there is so much disparity among them that it is difficult to present a general scheme that fits them all. A ventral foot, muscular, variously shaped (missing only in the Class Caudofoveata). A dorsal visceral mass containing internal organs. A mantle (with an epidermis secreting a calcium carbonate shell) covering the visceral mass and projecting on each side of the body to cover a mantle cavity containing the gills. From a biological point of view, the unmatched plasticity of the molluscan body shape provides plenty of models for the study of evolution and adaptation. The group ranges from almost microscopic forms less than one millimetre in adult size, to giant squids of the genus Architeuthis, which can reach over 15 m in size and hundreds of kilos in weight. The majority of molluscs, however, are smaller than one centimetre. It is possible to find examples of virtually every feeding strategy in the phylum Mollusca. These include active predators such as neogastropods and cephalopods, non-specialist grazers such as chitons and many vetigastropods, filter-feeders such as most bivalves, and many more. Some molluscs have evolved elaborate adaptations. Tridacna, a large reef-dwelling clam, incorporates photosynthetic zooxanthellae in its mantle and is in large part autotrophic. Other bivalves associated with hydrothermal vents or seeps are sustained by chemosynthetic bacteria and some of them lack a functional gut. Many small species, including the large and diverse gastropod families Eulimidae and Pyramidellidae, are ectoparasitic on other invertebrates. Whereas there is little disagreement regarding the extant classes of Mollusca, there are many contentious questions in the classification of extinct forms, especially from the Paleozoic. There is a major uncertainty regarding the status of some monoplacophoran-like molluscs, which may, or may not, be gastropods, depending on whether their visceral mass has undergone torsion (the hallmark of the class Gastropoda) or not. As this trait cannot always be determined from the shell only, there are many taxa of uncertain position. The extinct class Rostroconchia is unquestionably recognized as belonging to the Mollusca, but this issue is not straightforward for the enigmatic Hyolitha and Tentaculitida; the latter are not in the scope of MolluscaBase. The project for MolluscaBase began in February 2014, with a meeting at the Flanders Marine Institute (VLIZ) in Oostende, bringing together a group of malacologists (Philippe Bouchet, Gary Rosenberg, Serge Gofas, Simon Schneider, André Sartori, Eike Neubert, Ruud Bank) among whom molluscan editors of WoRMS and Fauna Europaea, and members of the data management team at VLIZ. Considering that WoRMS had achieved being ca. 95% complete after less than a decade of effort, and that there was so far no comparable list available for land and freshwater molluscs nor for the fossil species, the moment was found appropriate to launch the initiative. The first major input, completed by November 2014, was the import of the FreshGEN database regarding all fossil freshwater gastropod species described from the Miocene and Pliocene of Europe (23.03-2.588 million years), with 4,360 taxa. The FreshGEN database was compiled within the project "Freshwater systems in the Neogene and Quaternary of Europe: Gastropod biodiversity, provinciality, and faunal gradients" funded by the Austrian Science Fund FWF (Project no. P25365-B25) under the leadership of Mathias Harzhauser and Thomas Neubauer (NHM Vienna) – taking the option to join MolluscaBase instead of launching a separate database on the web. New Zealand Cenozoic Mollusca and New Zealand Recent terrestrial Mollusca (altogether ca. 3400 species) were added by Bruce Marshall. The next scheduled upload regards the molluscan data of Fauna Europaea, curated by Ruud Bank and resulting from an EU funded project within the Fifth Framework Programme since March 2000. This covers all land and freshwater species of Europe. MolluscaBase will develop through the inputs of active taxonomic editors, following the successful model of WoRMS, and also seeks the collaboration of external data providers who are willing to provide large, structured datasets to MolluscaBase, nonetheless retaining their own individuality and acknowledged as “basis of records”. The MolluscaBase initiative is supported by LifeWatch, which is part of the European Strategy Forum on Research Infrastructure (ESFRI) and can be seen as a virtual laboratory for biodiversity and ecosystem research. The MolluscaBase logo was designed by Jan Johan ter Poorten, taxonomic editor for the Cardiidae family and graphic designer. Individual pages are individually authored and dated. These can be cited separately; the proper citation is provided at the bottom of each page. Appeltans, W., Ahyong, S. T., Anderson, G., Angel, M. V., Artois, T., Bailly, N., ... & Hopcroft, R. R. (2012). The magnitude of global marine species diversity. Current Biology, 22(23), 2189-2202. Rosenberg, G. (2014). A new critical estimate of named species-level diversity of the recent Mollusca. American Malacological Bulletin, 32(2), 308-322. Taylor, P.D., & Lewis, D.N. (2005). Fossil invertebrates. Harvard University Press, 208 pp.